Finding out I was pregnant definitely ranks very, very high on my list of most exciting moments ever. The feeling was a mixture of surprise, disbelief, fear, wonderment, and best of all, true and pure joy. Along with all the thoughts and dreams of what this little baby was going to bring to our lives and how this little baby was going to change our lives for the better, came the thoughts and dreams of how I now had an excuse to design a room! Which room would it be though … that hideous room with the red carpet and the huge bleach stain that I did my best to cover up? That gross room with the blue bi-fold closet door and blue trim that housed all of our mismatched furniture? That room that I “designated” as a guest room but would have been utterly embarrassed had anyone actually wanted to stay in there? Yes, that room was to become our little baby’s room. How dare we. But we did. It was finally time to re-do the portion of the house that we ran out of money to re-do in the first place, when we re-did the rest of our house. I was thrilled. And I’m kicking myself right now for not taking “before” pictures. I think I was too ashamed. Kidding, I’m just really bad about taking “before” pictures. I should have about 200 of the entire house, considering the entire house has basically been redone, and I think I have maybe 10. But unfortunately none are of the “red room” as I used to call it, courtesy of someone’s awful choice of carpeting. You’ll just have to trust me when I say it was really, really bad. I perused Pinterest almost daily and because something told me I was having a girl, 98.9% of the pictures I pinned were for baby girl nurseries. So I had to change that line of thinking when we found out that “it” was a boy. Oh happy day! 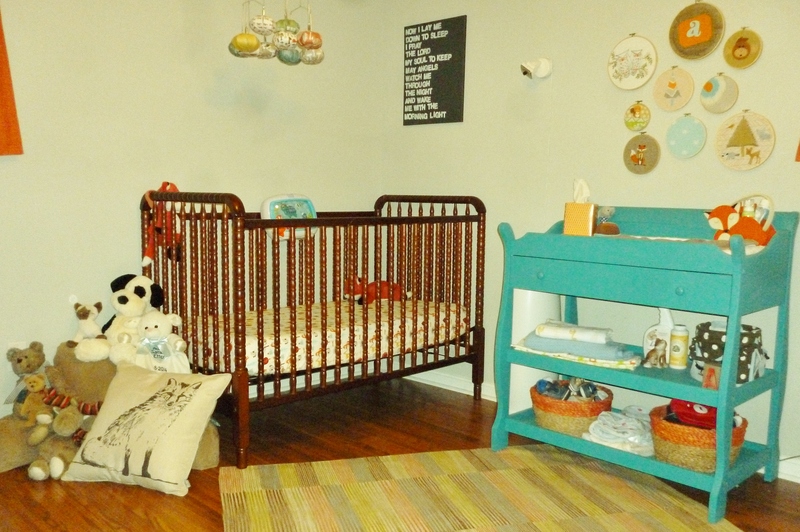 There were actually really cute ideas for baby boy nurseries! I am a very picky person when it comes to design. I can’t describe what I like, I just know it when I see it. When it came to the nursery, I was no different. The only things I did know were that I didn’t want all blue, I didn’t want a sports theme, and really I didn’t want any “theme” at all. After much thought, I decided to go with gray, burnt orange & turquoise as my main colors. I decided I wanted there to be foxes, but not too many foxes, and no foxes wallpapered or stenciled on the wall, because then it would be too theme-like. 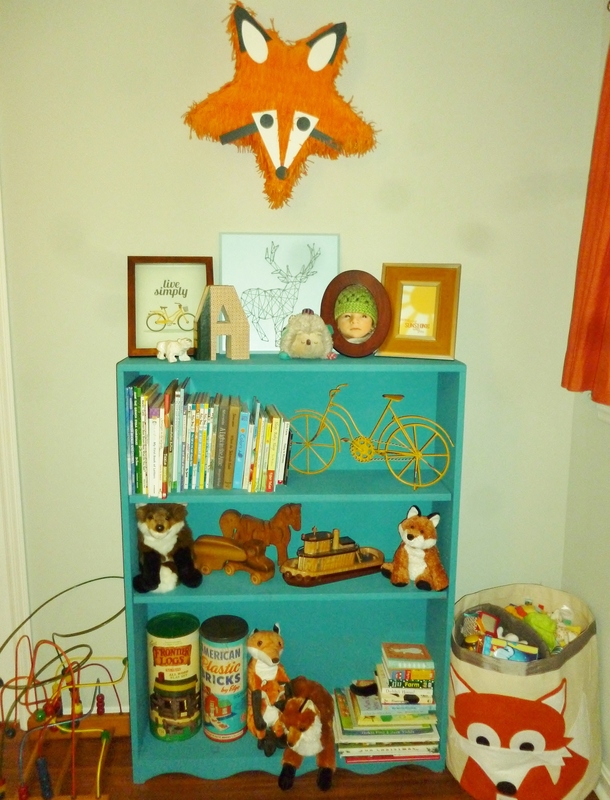 I also decided I wanted the room to have a vintage feel to it – none of this cutie patootie stuff for our little boy. I planned on doing all these crafts and DIY projects for his room, but since I’m super indecisive and since Austin decided to make his debut 5 weeks early, I didn’t quite get around to everything. Thanks to my talented brother and awesome husband, the red carpet was gone and new flooring had been laid. Thank God! The walls were painted Sherwin Williams Aloof Gray and the Jenny Lind style crib was put together, and I think that was about it. 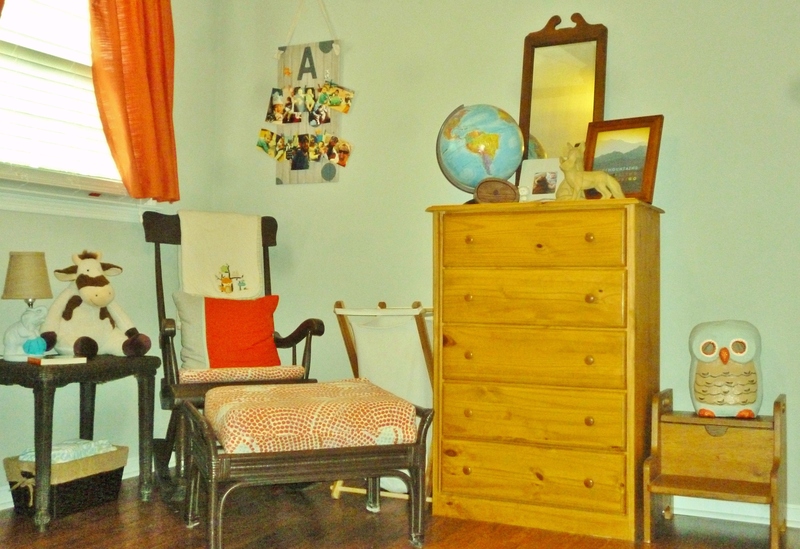 I had a bookshelf, changing table, rocking chair, footstool, side table and dresser in the basement that needed to be refinished somehow, but I hadn’t decided exactly how yet. Needless to say his room was nowhere near ready, nor were we, but it’s amazing how quickly that was forgotten when we saw Austin for the first time. Immediate love. Thank God for my Mom, online shopping (especially Etsy), and wonderful family & friends, because without them his room would still not be ready. He would be so upset. In my next post I’ll give some tips on one of the projects that I did end up completing, so be on the lookout!